We are happy to welcome a new contributor to Hoperatives. Brad Horak is currently taking Carla’s Beverage Tourism and Tasting Management class this spring and is working towards his Brewing Sales and Marketing certificate. This is the first of a series of articles he is going to be writing on new local breweries. From the moment you step into The Woodburn Brewery, you will notice that there is just something special about this brewery. Unlike many other breweries, the taproom at The Woodburn is designed to be more than just a brewery that also happens to have a taproom. At The Woodburn, a lot of thought and planning has gone into the design for both the brewery and the taproom. The taproom experience is elegantly refined by its industrial modern decor, friendly and knowledgeable staff and a wide selection of high quality craft beers brewed by one of Cincinnati’s finest brewers, Chris Mitchell. Chris has been brewing beer for over 17 years. His career in brewing first started at Listermann Brewing Company in 2000. At that time, he was primarily working with customers on the retail side of the business. It was also while he was working at Listermann that he met Dennis Chacón. Dennis was a customer that shared the same goal as Chris to one day open his own brewery. The two decided to join forces and they began working on a business plan, found their desired location, and designed the brewery’s building. Their hard work finally paid off last year on August 26th when they opened the doors for the grand opening. I recently met up with Chris to get a behind the scenes look at the brewery. He gave me a personal tour and I was able to observe him and his two brewing assistants at work. I was especially fortunate, because on this particular day they were brewing a batch of beer from their smaller 3 barrel pilot system for the upcoming Bockfest. Normally, they use the much larger 20 barrel system. This particular batch of beer will be available for a limited time for Bockfest at Arnold’s Bar and Grill and at the Christian Moerlein Malt House. During my tour, Chris explained in detail many of the decisions that he and Dennis made during the early stages of their planning. Perhaps the most important decision they made was choosing the brewery’s location. The Woodburn is located in the heart of East Walnut Hills. They liked the area because Dennis lives nearby and they saw a lot of potential in the neighborhood. At the time, several new businesses were opening. Today the neighborhood is abound with restaurants, bars, shops and salons. Chris also mentioned, “There is a lot of foot traffic. The flying pig runs by. The marathon people train along this route, so there’s always people jogging in front. They have the walk on Woodburn and the parking just behind us is nice.” The Woodburn Lot, a free public parking lot, is conveniently located adjacent to the brewery. The building is designated as an historical building. It was originally built in 1909 as a movie theater. During the building’s renovation, Chris and Dennis made some fascinating discoveries. They found an orchestra pit that was used to play music during the films, since at that time motion pictures had no sound. There was a false wall that would have had a screen adhered to it. They also discovered that along the walls there were joist pockets where they could see how the floor had been slanted down for the theater’s seating. During the 30s and 40s it was used as a bank. In fact, before the renovations, there were still bars on the windows and a vault in the back. In the 70s, it was used as a dry cleaners. In more recent years, it was as a used for neighborhood storage. It was full of items that had been left over years. Chris and Dennis purchased the property in late 2014 and did much of the restoration themselves. The taproom has a modern industrial design. The walls are exposed brick and the bar’s counter top is made of concrete. The back bar is enshrined in copper. Even the lights on the walls and the hanging fixtures espouse this industrial theme. It may have an industrial theme, but that does not mean it feels cold. The wood accents on the bar, furniture and the ceiling’s cross beams soften the steel, copper and concrete. Seating has also been carefully considered. There are several stools at the bar. There are high tops, tables and benches. They even have four small tables affixed to walls, perfect for resting a pint while either sitting or standing. They have done a remarkable job branding the taproom. Their logo is prominently displayed on the glass doors, glassware and even on the signs for the restrooms. The logo’s design is the Phoenix. The Phoenix represents rebirth, and for The Woodburn it symbolically represents the rebirth of Cincinnati’s brewing heritage, an ideal that Dennis and Chris have embraced. The taproom features a modest amount of merchandise. T-shirts, growlers, hats and glassware are available for purchase. Staffing has also been an important consideration for the management. When asked what they look for in a taproom employee, Chris responded, “You have to have a perfect blend of, you know, be friendly, be social, interact with customers and know enough about the beer.” Whenever Chris has a chance he will bring a bartender into the back and teach them about the brewing system. They periodically have employee meetings where they train the staff and have tastings. The end result is a well informed and friendly taproom employee. The taproom currently has 17 beers on tap. They carry four core beers on tap: the Steinpils, the Cedar IPA, the Berliner Weisse, and my personal favorite, the Chocolate Cherry Stout. Having the 3 barrel pilot system, mentioned earlier, has allowed them to more easily fill in the taps to offer 16 to 17 beers. Chris added, “I think, there’s not a lot of places in town that have that many of their own beers on tap like that.” Another very popular beer that could move up the ranks to a core beer is the Hans Solo, a coffee infused pale ale. I asked Chris about his most unique beer. He said it would probably have to be the Anchor Oyster Stout. It is brewed with oyster shells and oysters. This stout was specially made for The Anchor restaurant, a local seafood restaurant. It is also currently available in the taproom as a seasonal. The taproom does not have a kitchen; however, Mazunte rents a space next door and provides some light food, such as chips and salsa, on Tuesday through Sunday. Customers can bring their own food or they will often order food to be delivered. Dog lovers will be happy to know that their dogs are welcome! 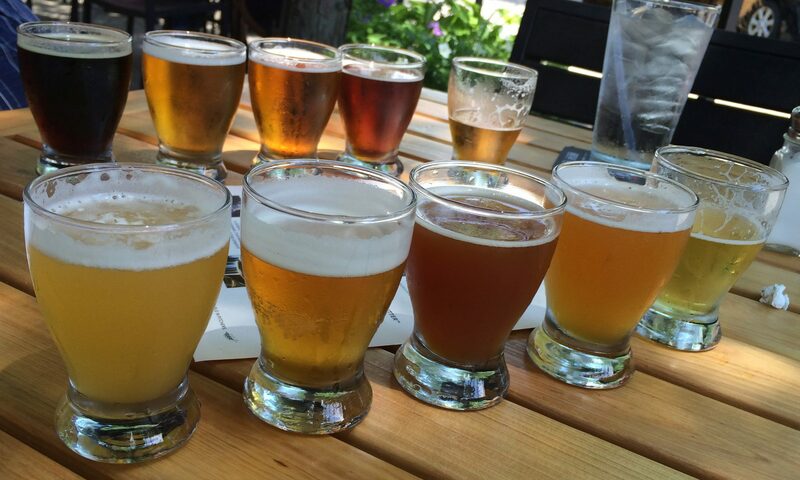 The Woodburn Brewery is located at 2800 Woodburn Ave and is open Monday through Friday, 4pm to 12pm; and Saturday through Sunday, 12pm to 12am. Really good article, Brad. 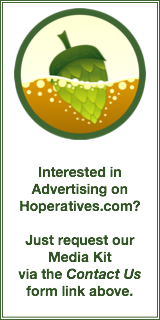 Welcome to the Hoperatives family!